Kiss & Tell, a monthly party at Rose Live Music in Williamsburg, Brooklyn, has been producing unique theme based events since 2007. Kiss & Tell DJs play italo, disco classics and edits, party jams, electro, synth pop, girl groups, gothypants, new wave, and prom pop. For the September Kiss & Tell we are celebrating the 200th anniversary of Mexico's independence from Spain and the 100th anniversary of the Mexican Revolution! 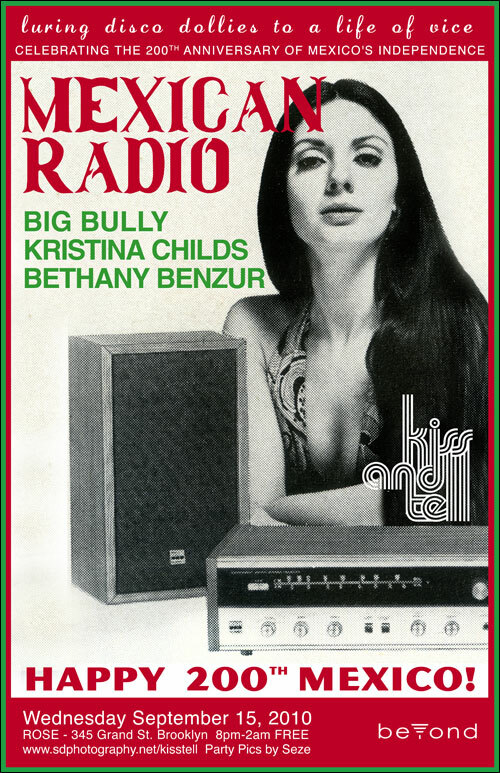 We have invited our favorite Mexican superstar Big Bully and Seattle's finest redhead Kristina Childs to play their favorite fiesta jams, Esquivel inspired Latino lounge, mexi new wave, cumbia, corridos, mariachi, salsa, merengue, romanticos, psych mex, vintage funk, guerrilla disco, and many special underground L.A. gems from Big Bully's crates. Dress to impress: Celebratory bright colors! Day of the Dead (Día de los Muertos)! Or dress up like your favorite Mexican icon: Frida Kahlo, Emiliano Zapata, etc. Zapatistas and Mexican Revolutionaries! Gangster zoot suits! Cholos/cholas! Gringos! Sombreros! Ponchos! Aztecs! Or just wear a silly taco costume! $5 Pasta Dinners and $5 Cuba Libre (rum & coke) all night long! Yummy cocktails will be served alongside Rose Bar's impressive rum selection. Born and raised in Seattle, Kristina Childs has held over 8 residencies and headlined events in Europe and South America. Her diligence in the Seattle scene has made her a popular Northwest DJ known for her energetic and eclectic performances. She is the curator of Plasmodium, co-creator of KRAKT and as a founding director of Decibel Festival played an integral role in making it one of North America's premier electronic music festivals. Kristina Childs' eclectic range of musical style has allowed her to share the stage with artists of many types, including Speedy J, Jacob London, Thomas Fehlmann and Bassnectar. In 2007 she won the Battle of the Mega-Mixes competition and successfully defended her title in 2008. She is known primarily as a techno DJ, however you can hear her play everything from ambient to hip-hop, downtempo, electro, disco, new wave or funk. Coming soon is Nastina, is the ghetto-fabulous alter ego of Kristina Childs. A more theatrical version of herself, Nastina whips up dancefloor energy through a mix of hip-hop, baltimore club, top 40 remixes & mash-ups, grime, dubstep, breakbeat and electro house. Hailing from Los Angeles with Mexican heritage, Dawson Baca (aka Big Bully) likes to work the crowd with his playful yet incisive cuts, jacked up beats, and sultry vocals. 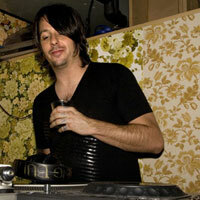 He is a dj/musician/vocalist/producer and label head of his label Mineral Musica. Bully's unique blend of streetwise flavor and techno sophistication certainly adds an edge to the minimal techno scene. This renegade musician is always in search of the new, whether he's on the decks, on the microphone, or rocking a live set. He has two releases coming out very soon with Adultnapper on Culprit and Simple Records. 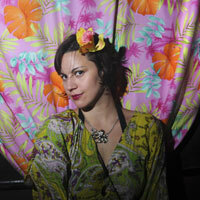 Kiss & Tell Resident DJ: Bethany Benzur is our beautiful resident disco encyclopedia and vinyl purist from Georgia. Ever since she emigrated to the Big Apple in 2007, Bethany has been ruling the dancefloor at Kiss & Tell parties with her Southern charm. The DJ nerds are regularly awed by her selections, and she joins us each month to warm you up with her mix of raunchy electro, glamorous dark disco, and soulful street funk.